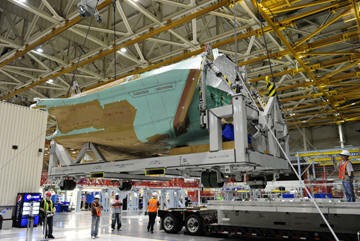 April 3, 2012 - Northrop Grumman Corporation's first F-35 center fuselage produced by its Integrated Assembly Line (IAL) was delivered to Lockheed Martin on March 16, 2012. While the company has delivered 69 center fuselages since 2005, this is the first produced using the IAL. The IAL maximizes robotics and automation, providing additional capacity and assembly capability while meeting engineering tolerances that are not easily achieved using manual methods. The IAL will be central in producing the F-35's center fuselage as well as increasing the program's affordability, quality and efficiency. The technologies deployed on the IAL have created more efficient and ergonomic process for assembly. The IAL was developed and designed with the help of the Detroit-based KUKA Robotics Aerospace Division, a commercial automation integrator, and was inspired by automation systems used by American automakers. The IAL design uses a system-engineering approach to integrate tooling and structure transport, system automation, automated drilling cells and tooling mechanization coordinated across multiple build centers. "The Integrated Assembly Line's approach to tool design and fabrication marks a transition into a new way of business for Northrop Grumman," said Michelle Scarpella, vice president of the F-35 program for Northrop Grumman. "Through the implementation of a much more efficient design-to-assembly process, the Integrated Assembly Line enables the team to simultaneously achieve higher quality, reduce costs and increase efficiency." As a principal member of the Lockheed Martin-led F-35 industry team, Northrop Grumman performs a significant share of the work required to develop and produce the aircraft. In addition to producing the F-35 center fuselage, Northrop Grumman also designed and produces the aircraft's radar and other key avionics including electro-optical and communications subsystems; develops mission systems and mission-planning software; leads the team's development of pilot and maintenance training system courseware; and manages the team's use, support and maintenance of low-observable technologies. To date, the company has delivered every center fuselage on time and continues to meet its cost and schedule commitments. In 2011, the company delivered 22 center fuselages and it will make its 100th delivery in December 2012. Northrop Grumman's Palmdale, Calif., site is a world-class facility that provides assembly, integration, testing and long-term maintenance capabilities for the F-35, and some of the world's most advanced aircraft, including B-2 Spirit and RQ-4 Global Hawk.